So it has been a really long time since I’ve posted anything here, but we tried this recipe out tonight and it was SO good and SO easy that I wanted to share. It got two big thumbs up from the kids! In a medium size bowl, stir spice cake mix and can of pumpkin together until well mixed. If it is too thick to mix well, you can add just a little splash of milk to help, but it should stay pretty thick. Dump in about half a bag of mini chocolate chips and stir in (half a bag really is enough). Scoop into spoon-size balls onto cookie sheet and bake at 350 degrees for about 10 minutes. 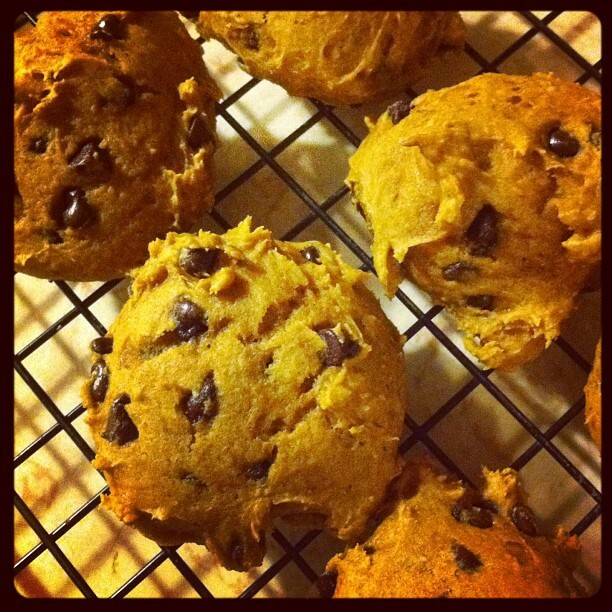 You can also easily make these into muffins, just bake a little bit longer. The kids and I were eating sandwiches and pretzels for lunch today and I was craving something sweet. I pulled out some raisins, and then suddenly decided some Nutella sounded good. I wasn’t sure what I wanted to eat it on, but I wanted it. Moments after, this tasty snack was born. It’s a super easy, semi-healthy snack that the kids can even make for themselves. 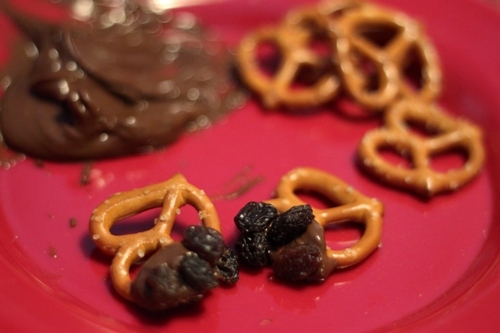 Dip the edge of a mini pretzel into the Nutella (a little goes a long way), then dip into a pile of raisins so that 3-4 raisins stick to the Nutella. Put in your mouth and enjoy the chocolaty, salty, sweet goodness!